Dilute 1 part E-Z KLEEN to 30-60 parts water depending on condition of surface to be cleaned. Always apply from bottom toward top, both on application and rinse. Do not allow surface to dry before rinsing. May be used in pressure washer, automatic type washers or applied by hand brushing. Product may be used with hot or cold water, but hot water will give faster cleaning. 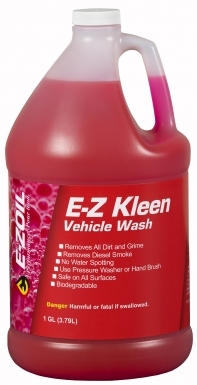 For heavy-duty exterior cleaning performance, reach for E-Z KLEEN!